WILLIAM BRANGHAM: In Peru, Nebraska, National Guard trucks bring a lifeline, bottled water. Volunteers unload the water after flooding from the Missouri River shut down the town's water treatment plant. Fred Knapp of Nebraska PBS station NET was in Peru. FRED KNAPP, NET Nebraska: Down here, there are about 10 houses that have been flooded by the Missouri River after a levee broke north of here. WILLIAM BRANGHAM: Across the state, roads, livestock and hundreds of homes have been swallowed by floodwaters. MAN: It is devastating. It is devastating. WILLIAM BRANGHAM: Flooding began last week after a massive late-winter storm hit. Water levels rose through the weekend, hitting those who live along the Missouri River the hardest. LISA LEMUS, Nebraska: It's about as bad as it gets. You know, you're starting over. WILLIAM BRANGHAM: Lisa Lemus, from Sarpy County, is one of hundreds who had to evacuate when waters flooded her home. LISA LEMUS: There is no words that can describe somebody's mental state when all this comes down. WILLIAM BRANGHAM: Rescuers in airboats came to save those who couldn't escape in time. 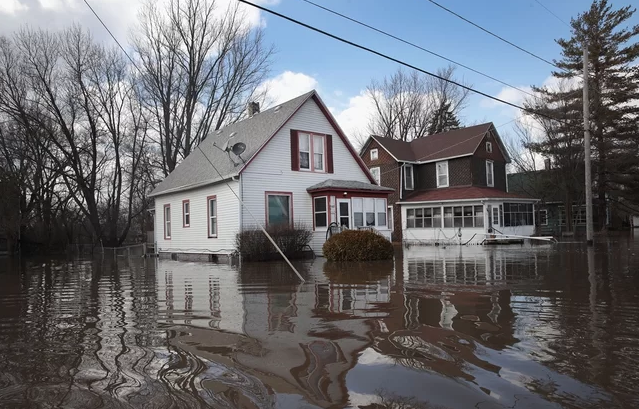 Across the Midwest, floodwaters brought record river levels to 41 places, including 17 spots in Nebraska. The water reached seven feet in some areas. On the eastern side of the Missouri River, nearly 2,000 people have been evacuated across Iowa. Floodwaters destroyed roads, including part of this bridge in Council Bluffs. Overflow from the Rock River in Illinois has inundated communities along its banks. And it could still get worse. Rain is in the forecast for Tuesday, and the Missouri River is expected to reach its highest level on Thursday. For the PBS NewsHour, I'm William Brangham.